Mar 31 Do You Practice any of these 5 Eating Habits? Apparently, you are not only what you eat, you are also how you eat. Sometimes, i wonder what all the fuss is about with eating healthy, exercising and why my Fitbit nags me all the time. I'd like to be left alone on a raft with an endless supply of food! Then i remember my health goals for 87, which is to be a hot granny! Who is with me? Here are 5 eating habits that promote healthy lifestyles. Do you already practice any of these habits? If you do, please share below! Are you the last to finish at the dinner table because you chew like a snail? Apparently, it's a great habit! Studies show that chewing slowly has tremendous health benefits. It helps to relieve stress, to maintain a healthy weight and to maximize caloric consumption! Chewing properly also takes the pressure off your gastrointestinal tract (GIT) during digestion. This is because well-masticated food digests easier and promotes GIT health. If you already do this, you are probably on your path to several clean bills of health! Young. Bet you are past that category, huh? According to a study at Stanford University, the most effective diets and eating habits are diets which begin when you are young. Evidence shows that developing healthy eating habits at a young age helps to increase life expectancy! This would include eating a balanced diet complete with fibers and loads of water and reduced carbonated drinks. Also see #6. Why didn't anyone tell me this years ago? Does it still count at my age? I'm young, right? In my opinion, it's never too late to begin! Do you take your time with your meals, consciously acknowledging all the explosive flavors that occur in your mouth? Watching TV while eating might be killing 2 birds with the same stone; it might also be getting you progressively unhealthy. 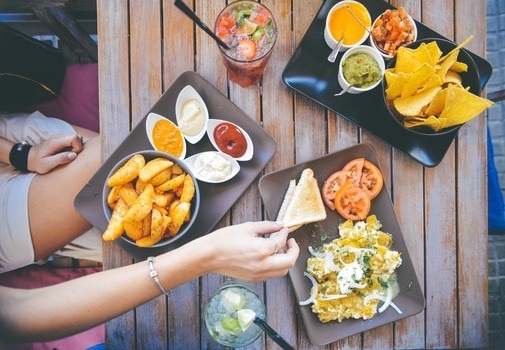 This report from Havard, shows that being distracted while eating increases food portions, which leads to weight gain and subsequently results in obesity . Another study shows that when the event of eating is associated with the event of TV watching, then every time you switch on the TV, your brain thinks it's time to eat! This is known as habituation, the TV becomes a stimulus to the hunger center in your brain(same as in #2), which leads to overeating, an increase in caloric intake and subsequent weight gain. This is so true, we haven't used our dining table in like 2 weeks! I also find myself planning multiple snack times in my mind once I switch on the Tv! Hehe. I definitely have to dissociate those two activities. Do you think up multi-snack opportunities while you watch TV too? Do you already practice any of these habits? P.s I found the remote by the way! Spring cleaning rocks! C'mon, no one says no to deliveries. Jan 25 Eat Your Way to Creativity: 15 Foods That Light Up Your Mind!